The old fashioned Valentine begins with these lines: Roses are red, violets are blue. 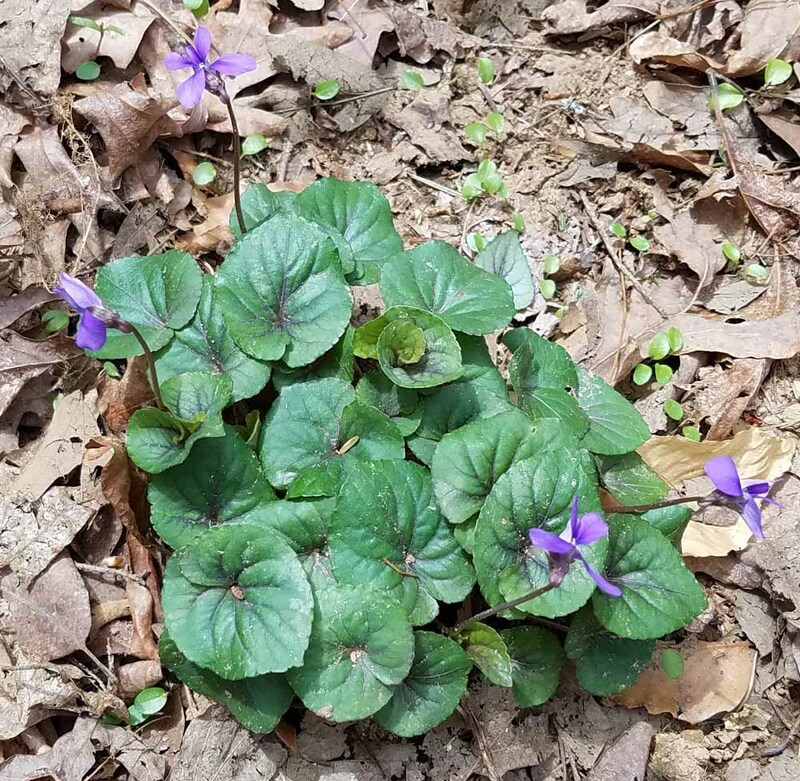 Those who walk woodland trails looking for signs of Spring know that violet flowers are blue/purple, yellow, white and green. 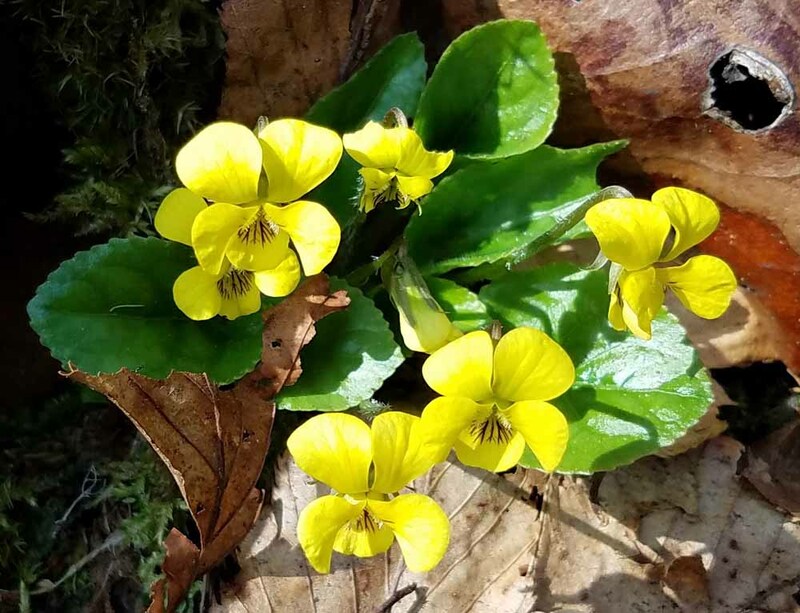 One of the earliest to bloom is the round leaf yellow violet, Viola rotundifolia. 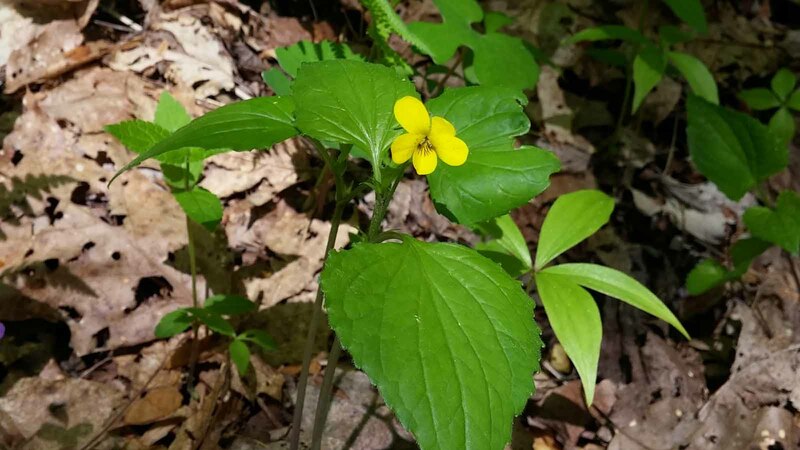 When the flowers appear the leaf is the size of a nickel or smaller. As the season progresses the fuzzy round leaves hug the ground and grow much larger. 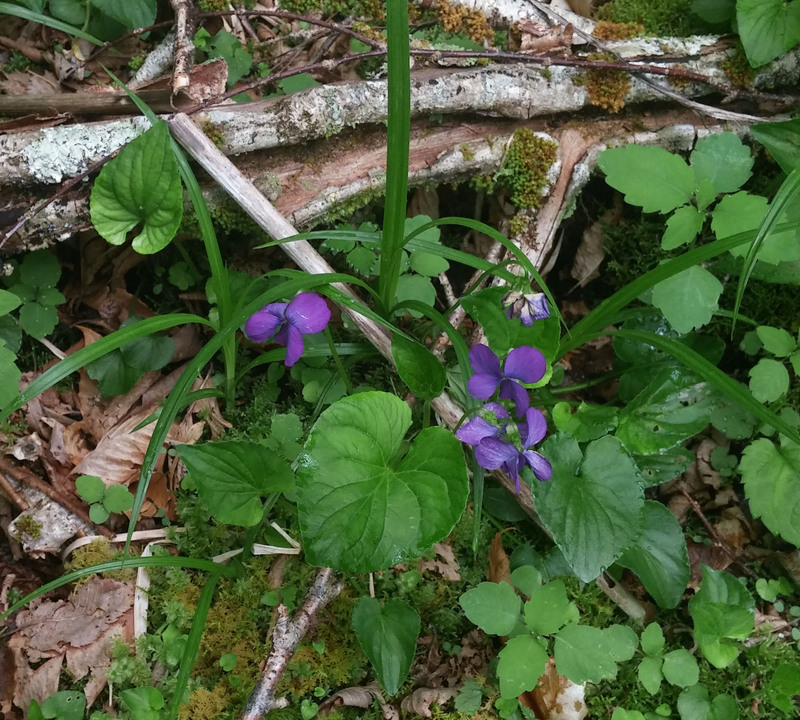 VIOLET identification keys are based on their bloom stalks. 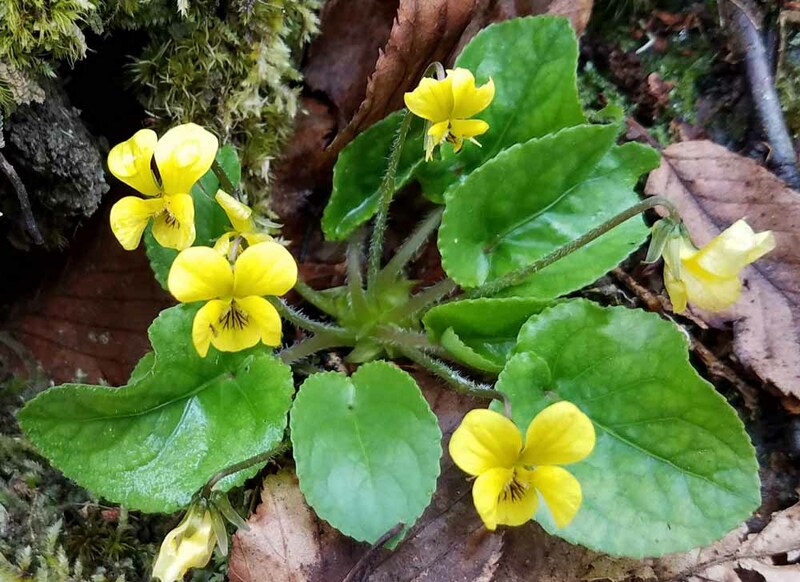 ACAULESCENT violets have leaves and flowers on separate stalks. 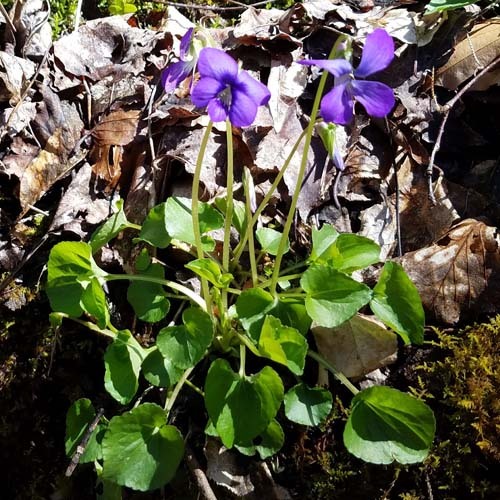 CAULESCENT violets have leaves and flowers on the same stalk. 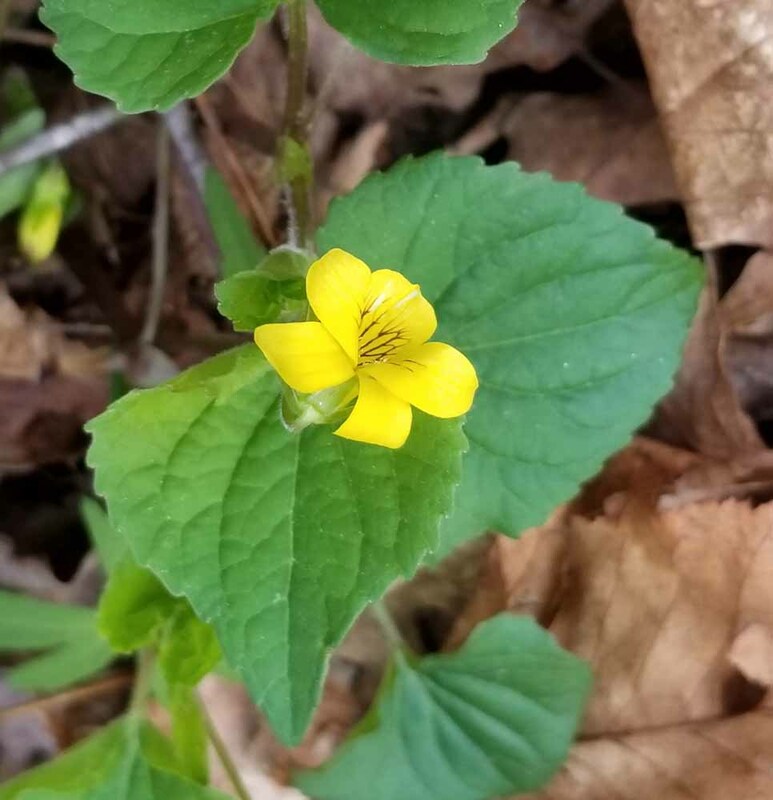 The only yellow flowered plant in this group. 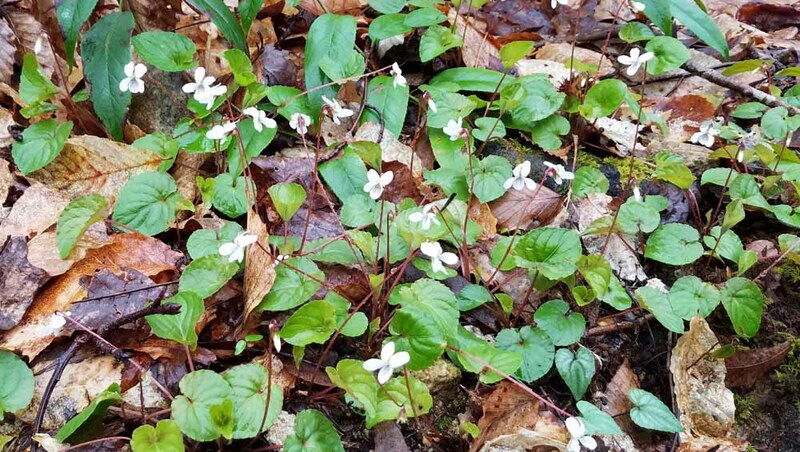 Leaves pubescent, small & round at flowering–continue to grow through season. 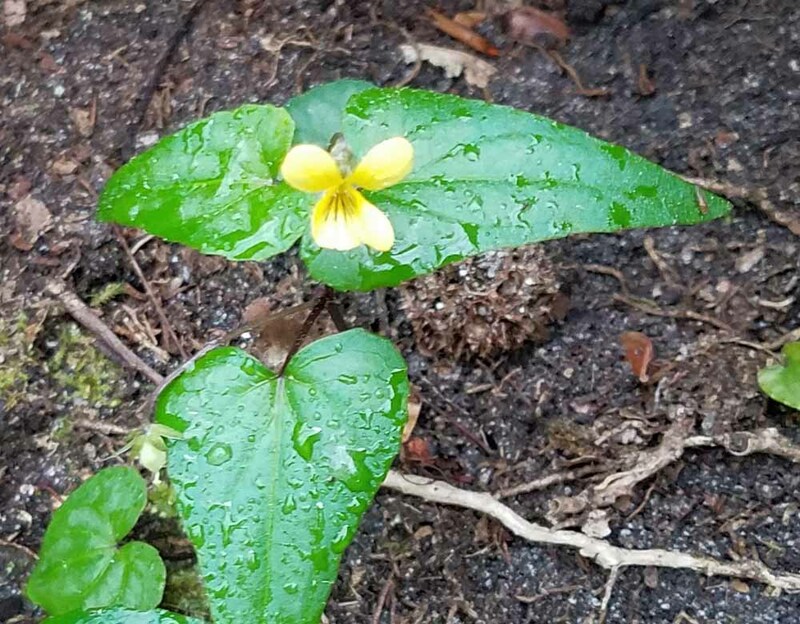 Usually found growing in moist areas. 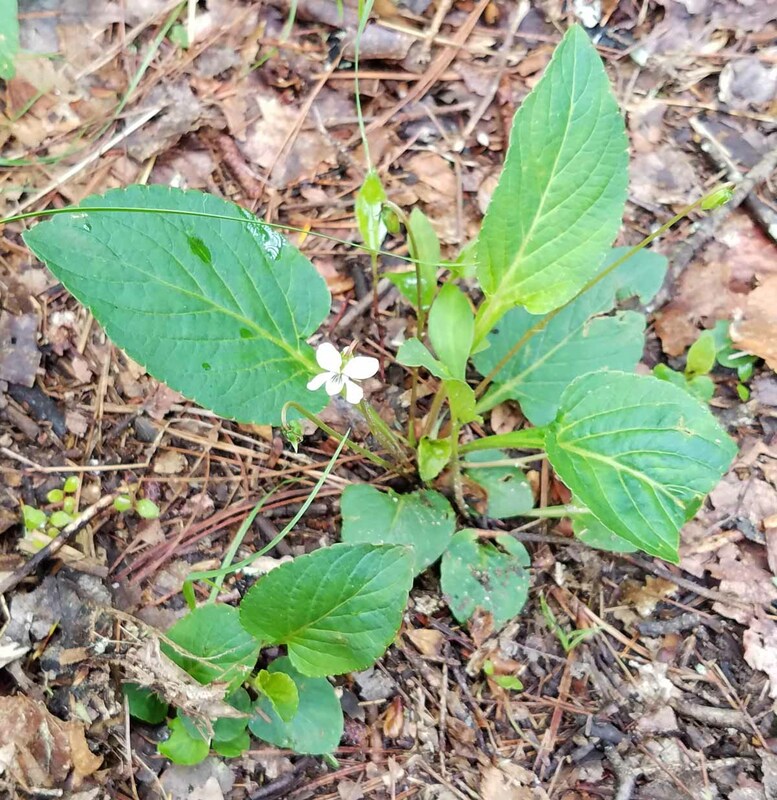 Flowers and leaves have reddish stems. 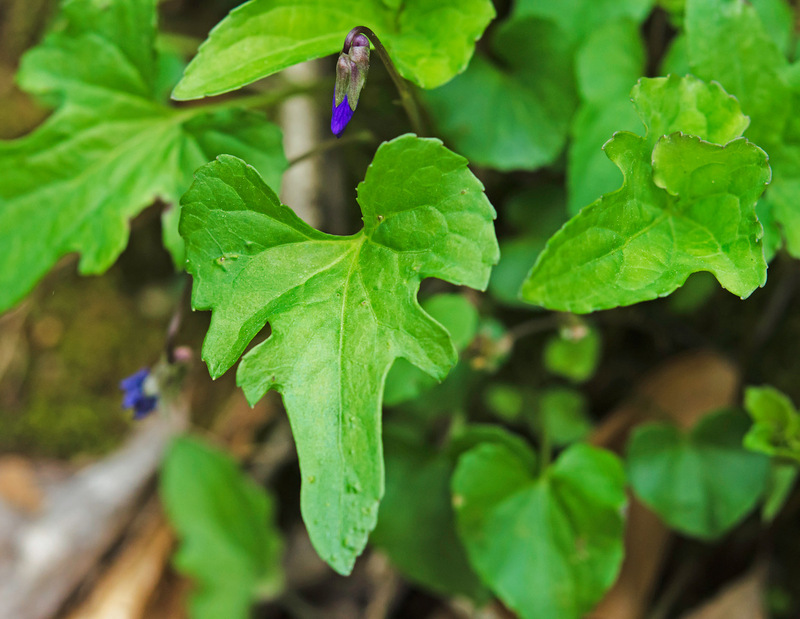 The leaf shape is lance ovate. Leaves lanceolate with winged petiole. 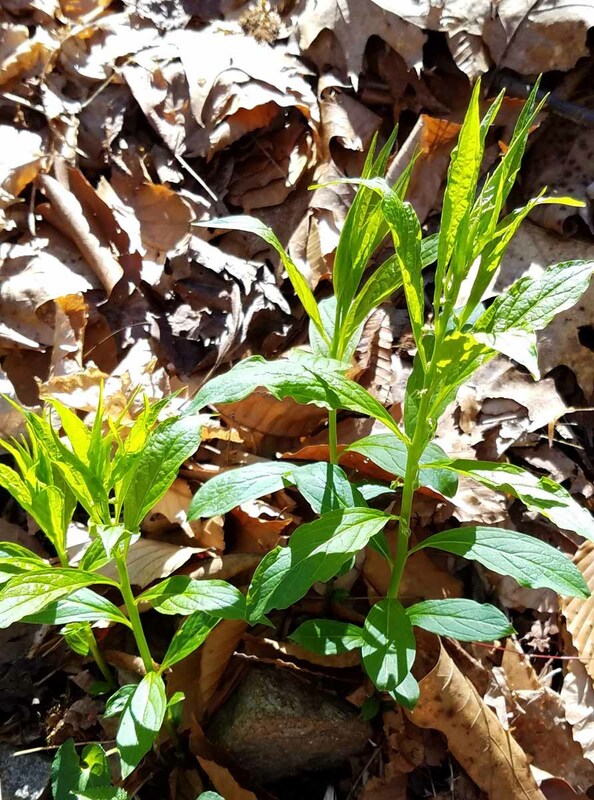 Leaves lanceolate, tapering to reddish petiole. 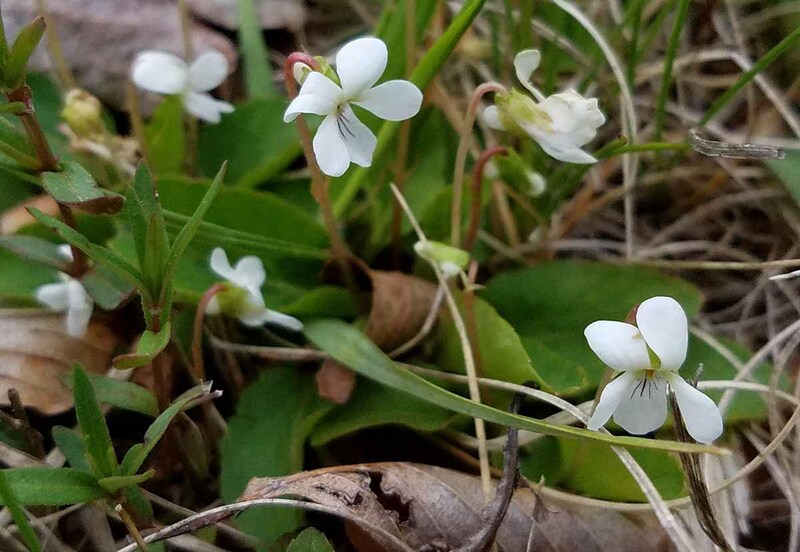 Grows in lawns and other open areas. 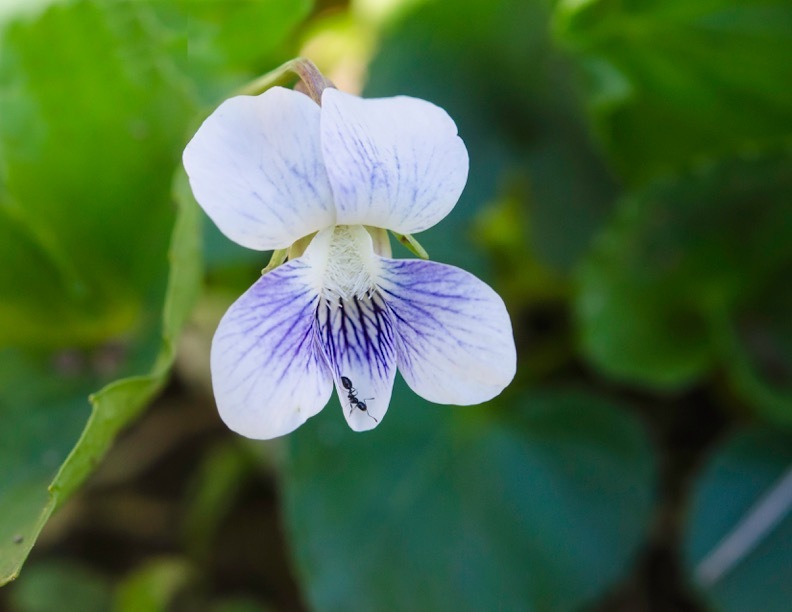 The white form is known as Confederate Violet. Leaves finely divided – resemble a bird’s foot. 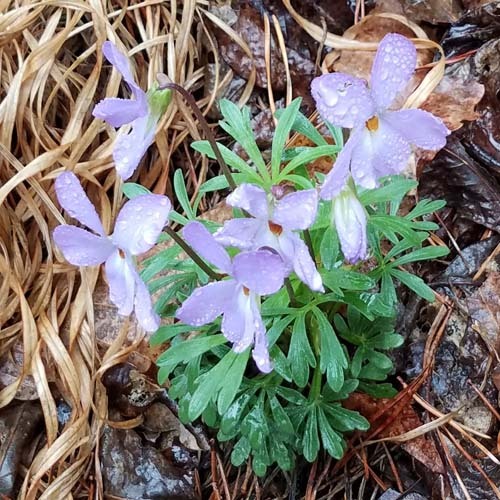 Grows in sandy soils in sunny locations. Flowers large with exerted orange stamens. The first leaves to emerge may be heart shaped but later leaves are lobed. 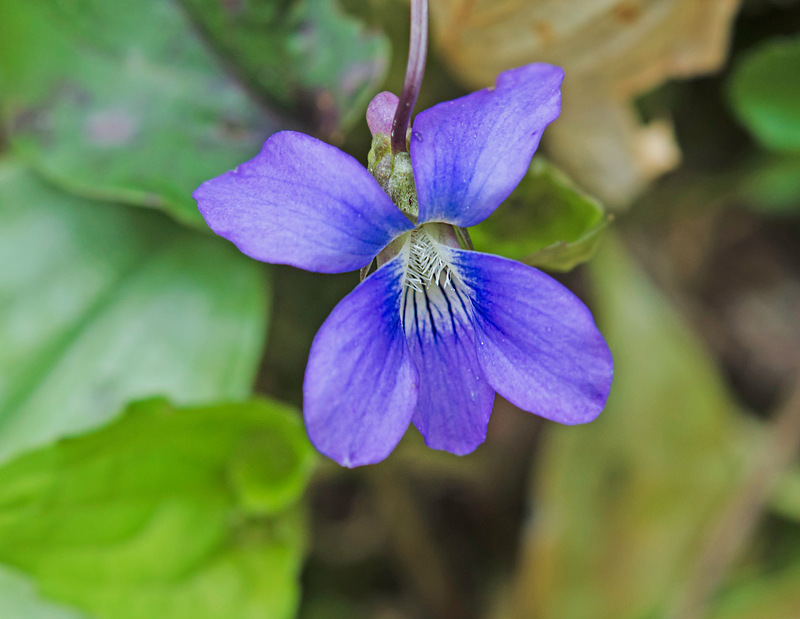 Flowers light blue with a dark eye; stand above the leaves. 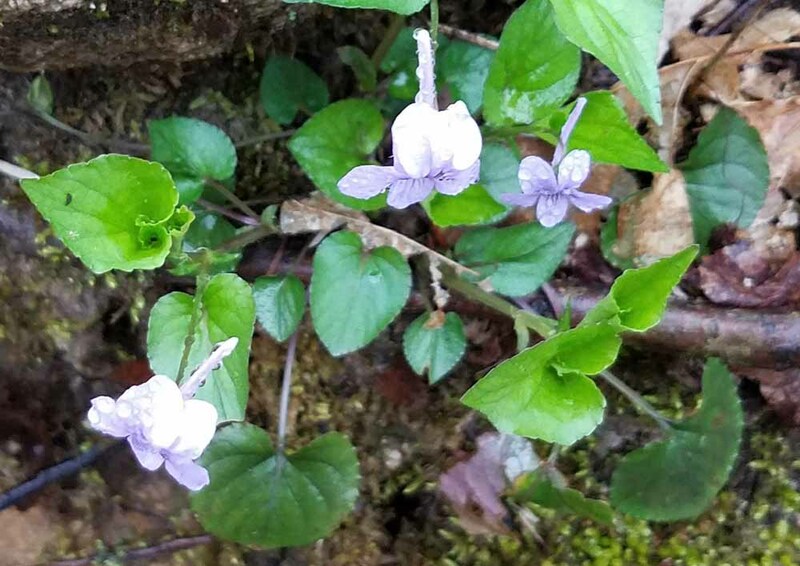 Viola hirsulata, Southern Wood Violet. Name refers to the triangular leaf that is shaped like a medieval ax. Leaves often have silvery markings. May be smooth or downy. 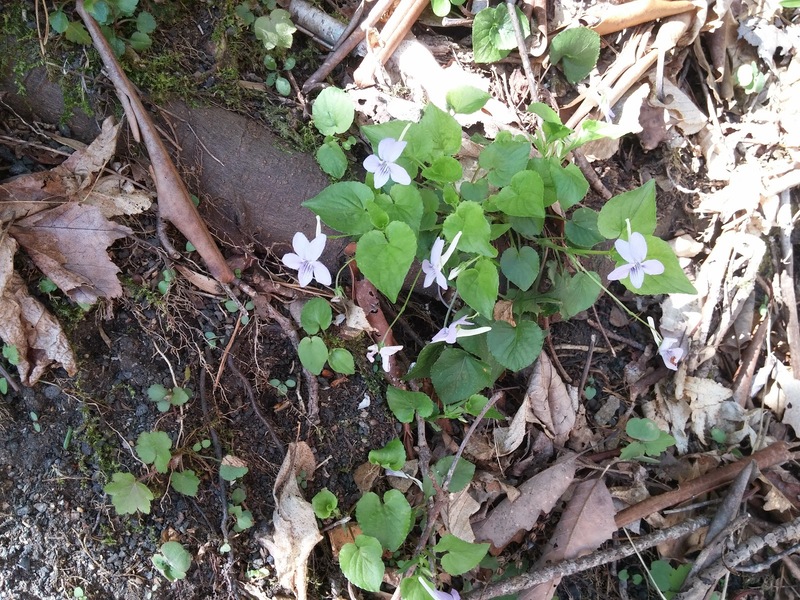 Flowers have brownish purple veins near the base. 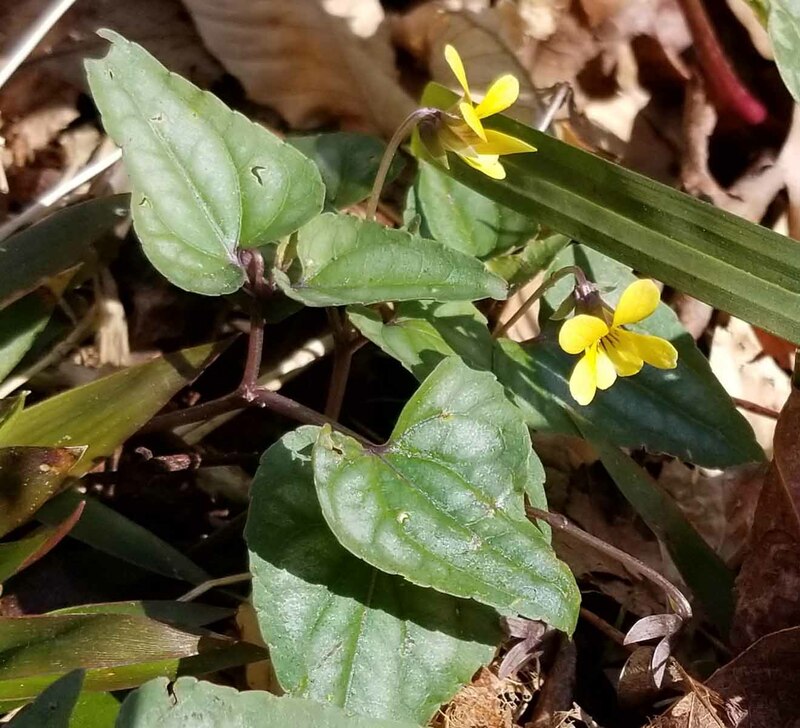 At one time this was classified as two genera; V. eriocarpus, Smooth Yellow violet and V. pubescens, Downy Yellow Violet. 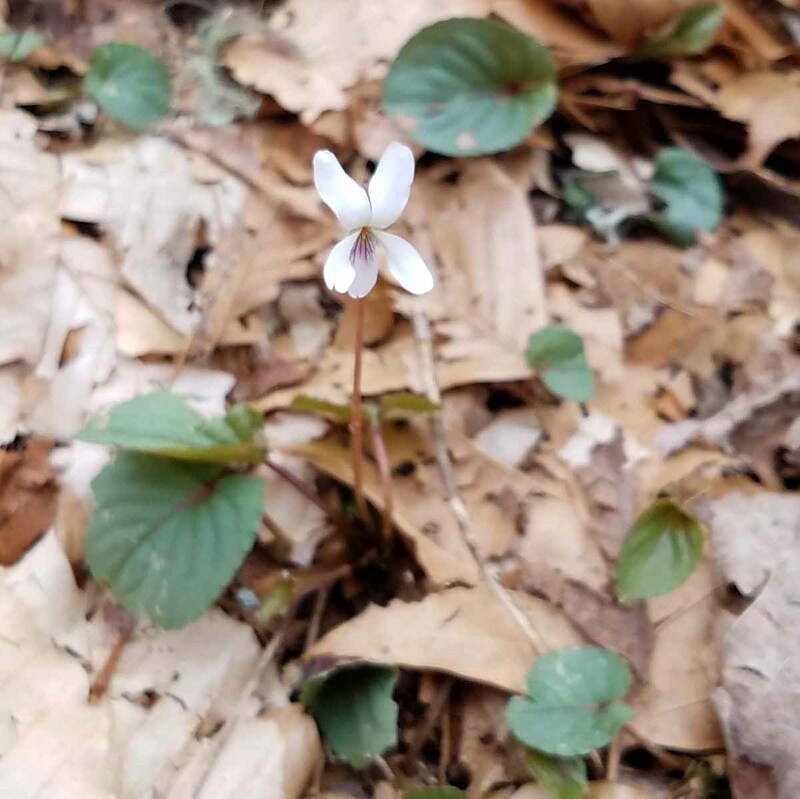 Grows in rich cove forests. 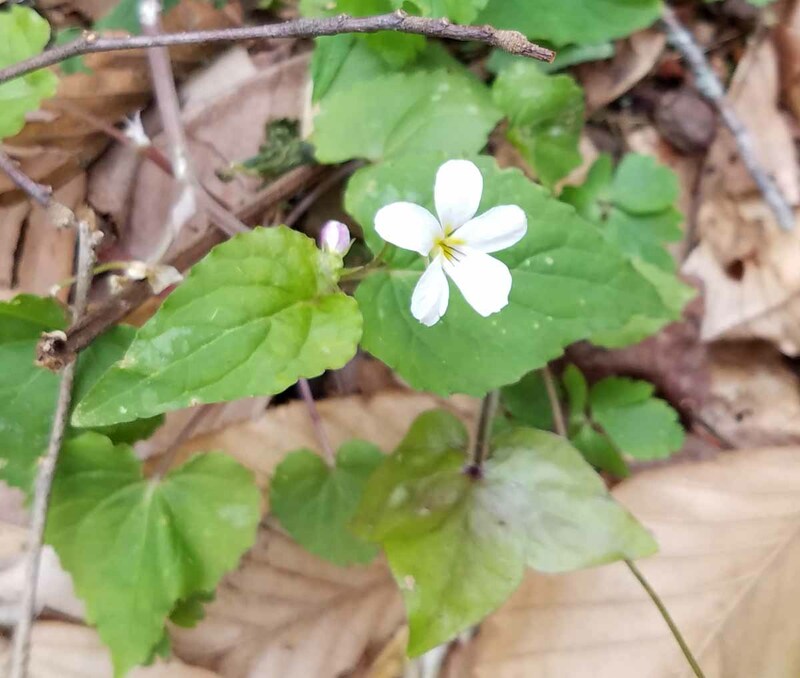 Flower has a yellow eye and may have a lavender tint on the back side. 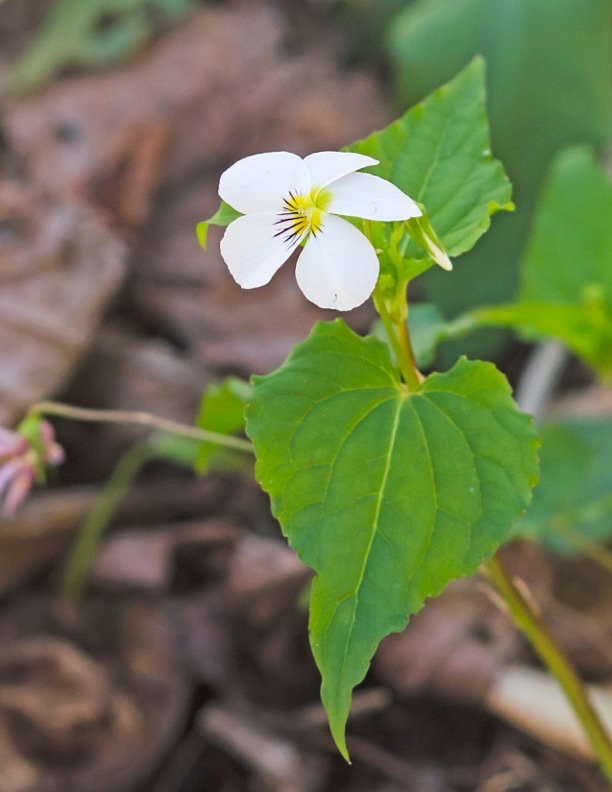 Gets its common name from the long, often ½ inch spur, on the flowers. 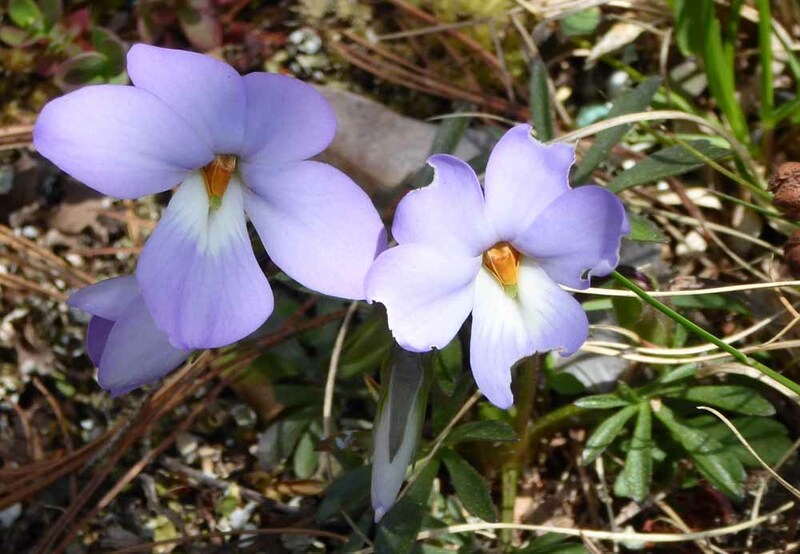 Hybanthus concolor, Green Violet, does not fit our idea of a violet. 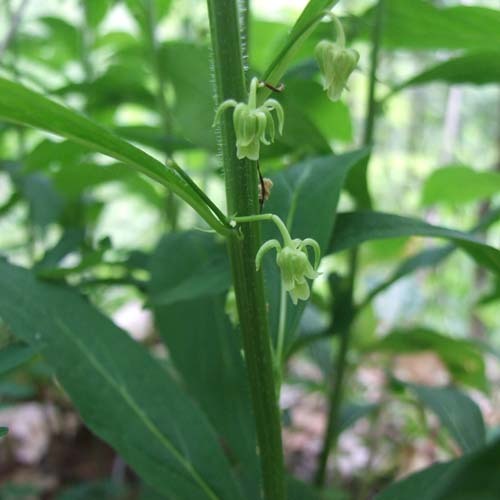 It is a tall plant with alternate elliptic leaves. Small green flowers are located in the leaf axils. It is usually found on alkaline soils. 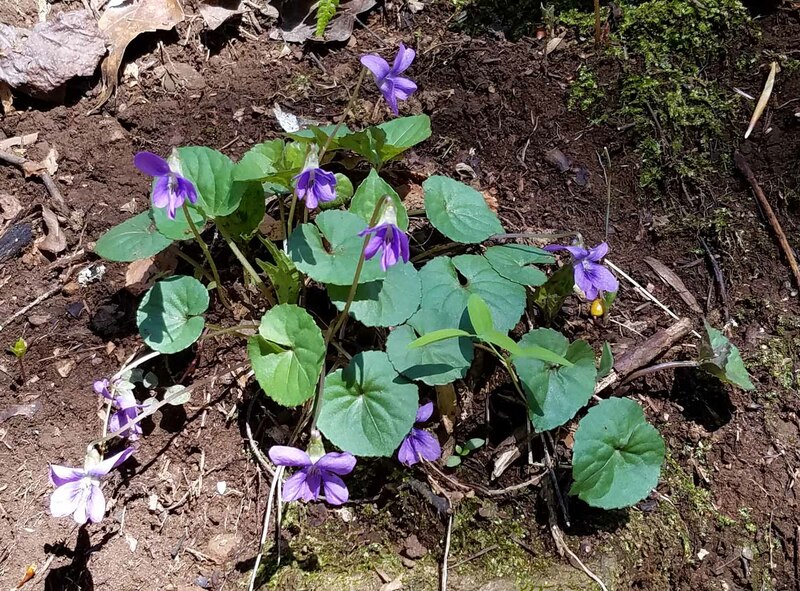 Let’s make it our challenge to find and identify these violets on our spring trips. 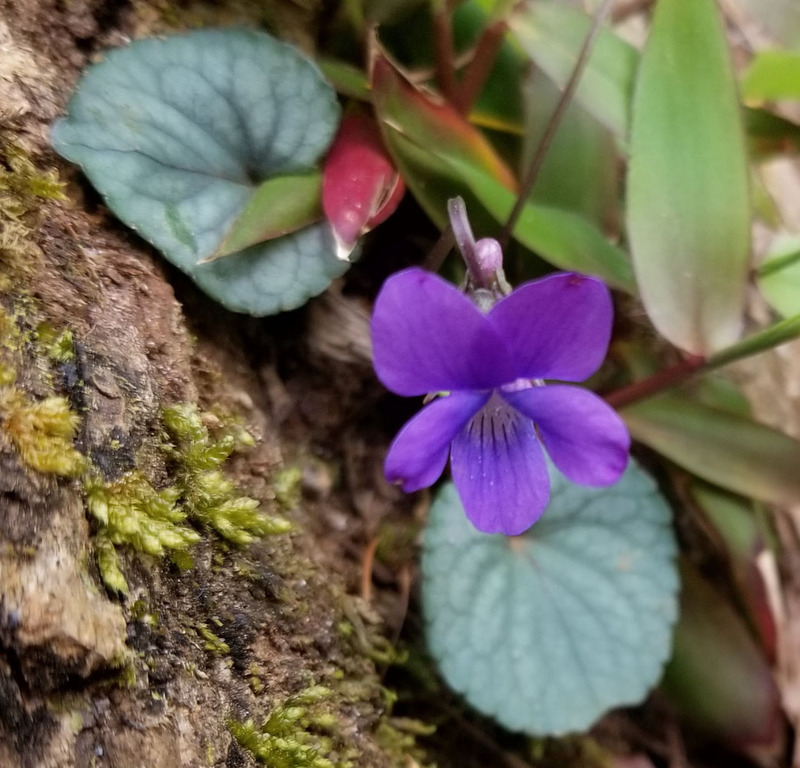 More violets will be added to the list in the near future. Text by Bonnie Arbuckle. Photography by Ken Borgfeldt, Penny Longhurst, & Jim Poling.